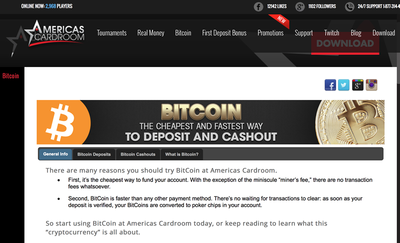 Americas Cardroom is a hugely popular U.S. poker room that now accepts bitcoin. They do not charge bitcoin transaction fees so deposits and withdrawals are free. ACR are part of the Winning Poker Network and fully licensed and regulated in Cyprus. Minimum bitcoin deposit is $10 and will be credited after 2 confirmations (20 mins). Minimum bitcoin payout is $25. BTC withdrawals are processed within 48 hours. 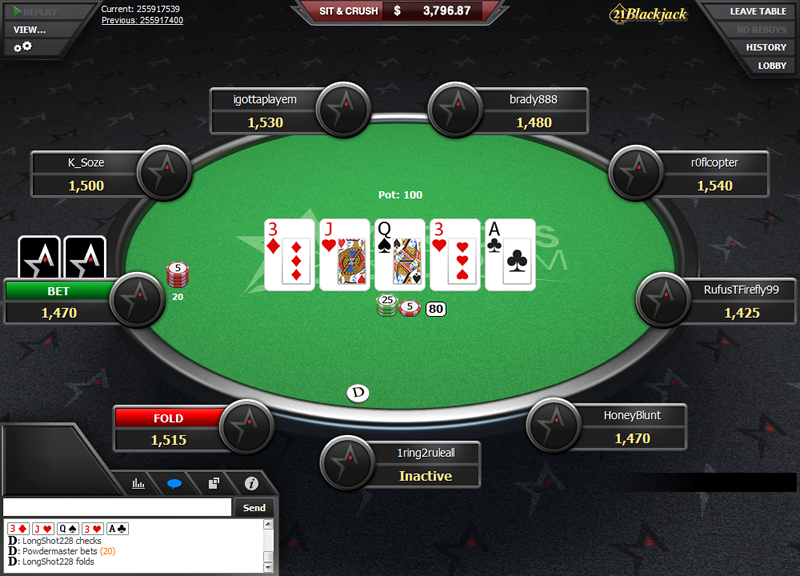 High traffic site with cash games, Sit N Go's and tournaments running at all times. Accounts are not anonymous. You will need to provide proof of ID to withdraw. ​First time depositors at ACR are entitled to a 100% new player bonus up to $1,000. Americas Cardroom is a veteran of the online poker world, with over 15 years of experience since its establishment in 2001. They are the biggest poker room on the U.S. facing Winning Poker Network, alongside other well know brands like True Poker and Black Chip. With Americas Cardroom you get all the cost savings of banking with bitcoin, while also playing at a major online poker site. Americas Cardroom is a regular fiat currency poker room that instantly coverts your bitcoin deposits into U.S. dollars so there is no segregation of players. Sharing its player pool with more than a dozen other partners of the Winning Poker Network, cash games, sit & go’s and tournaments are always running; buy-ins start from as little as $0.25 and most formats can be played as no limit, fixed limit or pot limit games with either two, six or nine players. Alternative variants of Hold‘em are offered, such as Omaha and 7 Card Stud, for those who like a bit of variety. 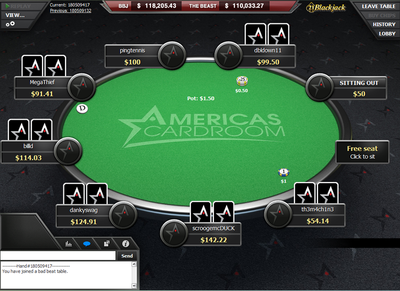 Americas Cardroom is home to some of the biggest tournaments in online poker, like the weekly Sunday Special boasting a $115,000 prize pool. There's also a brand new poker format called ‘Jackpot’ where 3 players compete for a prize of up to 2,500x their initial buy-in. As a member of the Winning Poker Network, Americas Cardroom has access to one of the smoothest and most acclaimed poker clients around. The table display is clear and spacious, allowing for customisable themes and a four colour deck so you will never misread your suit again. 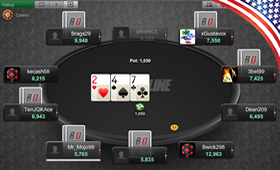 In-game chat and multi-table functionality are both supported, while statistics for your session are recorded so you can track your results (including ‘games won’, ‘$ won/lost’ and ‘raise/call ratio’), as well as saveable hand histories where you can review previous plays you’ve made. 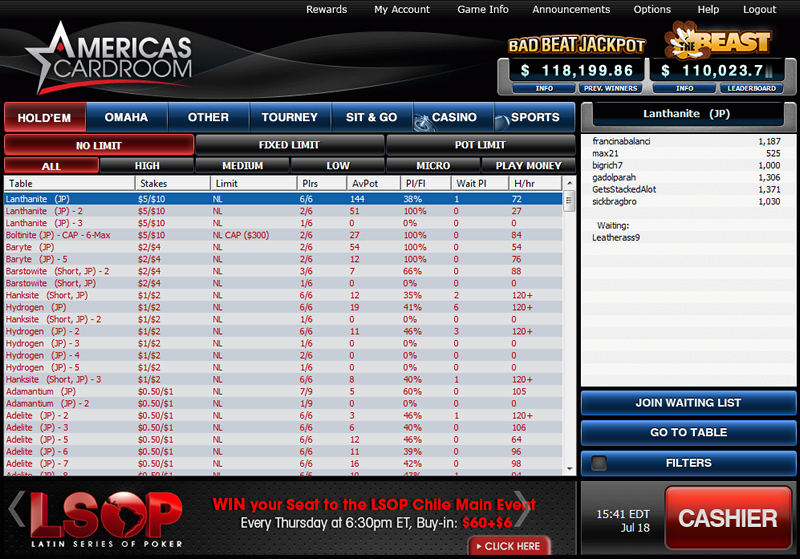 Americas Cardroom also provides a diverse casino and a huge sportsbook, which are both available from the poker client. Enjoy classics such as Blackjack, Roulette, Baccarat, Craps and Slots at the casino, and place bets on the NFL, NBA, English Premier League and more using the extensive sportsbook. Americas Cardroom are working on a mobile poker app for iPhone and Android but it will not be available until 2017. 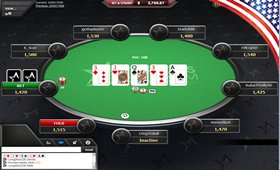 For bitcoin mobile poker, we recommend BetOnline Poker or any of these mobile poker rooms. 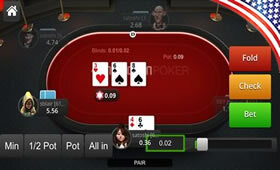 In order to register at Americas Cardroom, you must first download the poker client. This process only takes a couple of minutes: all you need is your e-mail address, postal address and date of birth. Deposits require a couple of confirmations so they usually appear in your account within 20 minutes. 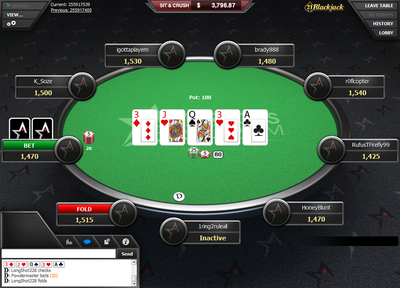 The minimum a player can deposit is $10 USD and the maximum is $25,000. Your bitcoin will be converted to USD at the current market rate, with no additional transaction fee incurred. To withdraw your winnings from the client, you will need to verify your account with a copy of your driver’s license and a proof of residence. The minimum bitcoin cash-out is $25 and you can request one bitcoin payout per day. Withdrawals are processed within 24 hours. Americas Cardroom is home to some of the most generous bonuses and promotions in online poker. There is a 100% welcome bonus for new depositors on amounts up to $1,000. You can also climb the ranks of the Elite Benefits loyalty scheme by playing at the tables to earn cash prizes, exclusive entries to live events and redeemable rewards. ​Partake in The Beast, a weekly race for points where players earn rake points by playing at cash tables and compete for a share of the huge jackpot. If Sit & Go’s is more your thing, earn rake points by playing SNG's to automatically enter Sit & Crush where you can win cash prizes and tournament tickets simply for playing poker. You can contact support through a variety of methods: call +1-877-314-4195 for free to speak to a representative over the phone; send an e-mail to support@acr.com (your issue should be resolved within an hour), or use the live chat function. 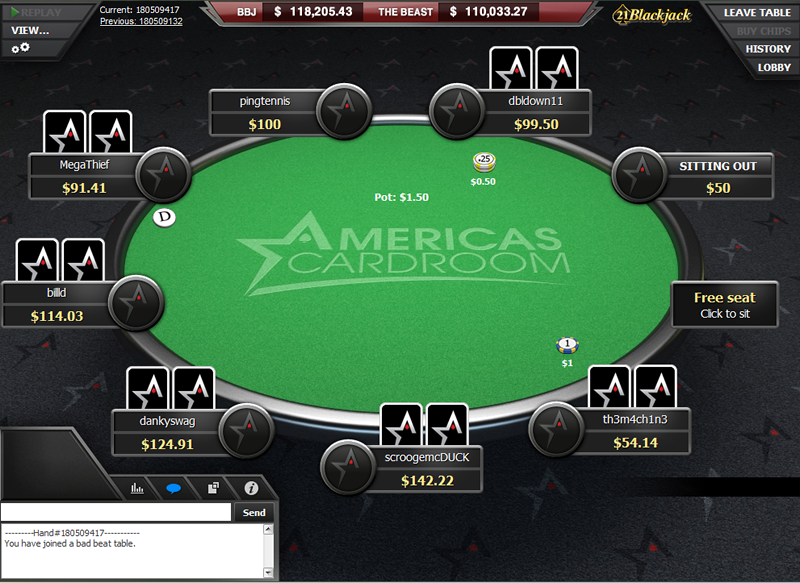 Americas Cardroom is one of the top 3 poker sites for U.S. real money poker players for good reason. They have an excellent poker client, high traffic and you can deposit or withdraw for free using bitcoin. They also run excellent promotions for new and existing players. 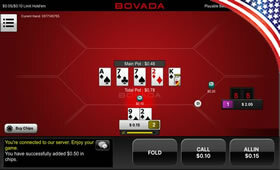 It's a shame that their iPhone and Android poker app won't be available for a few more months.